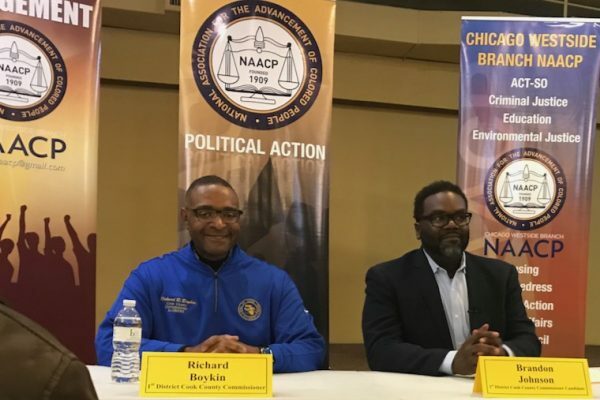 Cook County Commissioner Richard Boykin faced off against his Democratic primary challenger Brandon Johnson on Saturday at a raucous debate moderated by the Chicago Westside Branch of the NAACP. The debate, held at the Sankofa Cultural Arts and Business Center in Austin, was filled with supporters from both sides who cheered and hissed as the candidates for the 1st District board seat traded barbs, leading moderators to pause the debate several times. 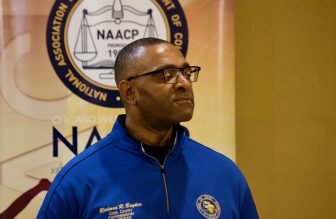 Boykin, an attorney who is running for a second term, wore a bright blue athletic pullover that prominently featured his name, district office and the Cook County seal. His supporters wore bright blue stocking hats and shirts heralding his re-election. Johnson, a teacher and organizer for the Chicago Teachers Union, wore blue jeans and a charcoal sport coat. His supporters, including one woman who wore a teachers union hat, were no less enthusiastic. 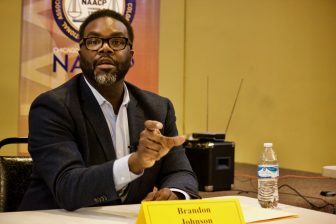 Johnson, a first-time politician, won a coin toss to begin the debate and described himself as a teacher who has witnessed firsthand the devastation of budget cuts and layoffs in the community. During his time as a teachers union organizer, Johnson said he fought for an elected school board, for closing corporate loopholes and to get stricter regulations imposed on charter schools. Boykin opened with a list of his accomplishments during this first term. Boykin also said he has worked to pass ordinances targeting gun violence and helped save taxpayers $52 million by eliminating more than 1,000 “vacant positions” in county government without impacting the health or safety of the community. Moderator Phyllis Logan read the first question, which asked each candidate to list the community organizations they were board members of. Boykin said he was proud to be a member of Streetwise, which advocates for the homeless, and The Chicago Lighthouse for the Blind. Johnson said he’s a board member of the community arts group Firehouse and of Arise Chicago, an organization made up of clergy and unions to support the rights of workers, which he said was integral to building up the Fight for $15 movement to increase the minimum wage. The following question, which asked the candidates to say how they would use their unique skills to make changes in the district if elected, also provided an opportunity for the candidates to continue taking swings at each other. Johnson said he was a coalition builder. “That’s what this district needs right now, someone who has the ability to bring coalitions together, to organize and actually get stuff done,” Johnson said. Boykin responded that he’d brought $25 million in economic development and resources for job training grants and violence prevention back to the district. When asked what they would do to ensure that African Americans were included in opportunities to get county contracts and jobs, Boykin said he had addressed that issue in regards to the county’s health and hospital system during recent budget meetings. Johnson responded by asking whether Boykin even believed in the role of government to offer services and job to the community, and he questioned Boykin’s characterization of his record. Johnson claimed Boykin had “bragged and called it a historic day when black people got laid off” by the budget the county passed. The debate had to postponed as moderators reminded the supporters in the crowd on both side to refrain from shouting and applause when the candidates answered questions. Boykin and his supporters called on moderators to allow him a rebuttal, which was granted for 30 seconds. Things also got heated between the candidates when they addressed a question about gun violence and the need to create economic opportunities for the community. Johnson said that when Boykin talked about securing neighborhoods, he was talking about “calling in foreign troops into our communities,” in reference to Boykin’s suggestion last year that U.N. peacekeeping troops could reduce violence in certain Chicago neighborhoods. One of the last questions asked at Saturday’s forum was whether the two men could work together regardless of the outcome of the March 20 primary. Johnson said he didn’t take any of Boykin’s attacks personally. Nearly a week after the March 20th primary, the first-term incumbent called his opponent Monday to say he "will do what I can to ensure he has a smooth transition."